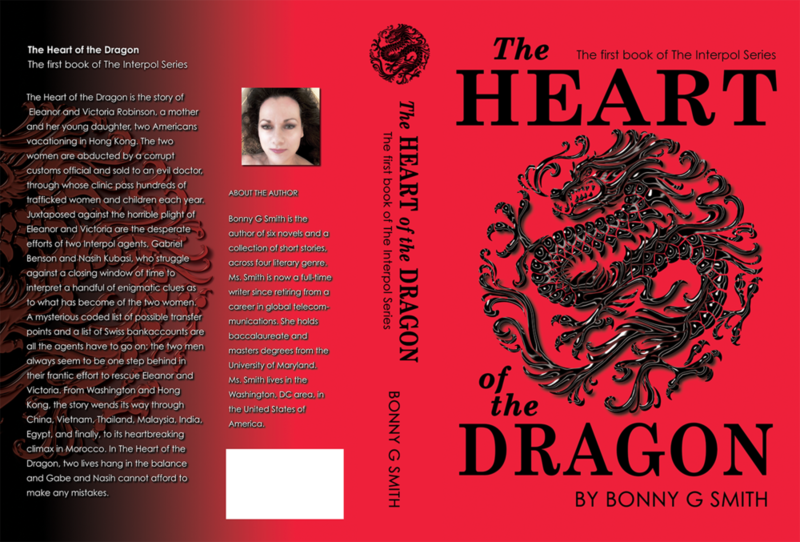 The Heart of the Dragon is the story of Eleanor and Victoria Robinson, a mother and her young daughter, two Americans vacationing in Hong Kong. The two women are abducted by a corrupt customs official and sold to an evil doctor, through whose clinic pass hundreds of trafficked women and children each year. Juxtaposed against the horrible plight of Eleanor and Victoria are the desperate efforts of two Interpol agents, Gabriel Benson and Nasih Kubasi, who struggle against a closing window of time to interpret a handful of enigmatic clues as to what has become of the two women. A mysterious coded list of possible transfer points and a list of Swiss bank accounts are all the agents have to go on; the two men always seem to be one step behind in their frantic effort to rescue Eleanor and Victoria. From Washington and Hong Kong, the story wends its way through China, Vietnam, Thailand, Malaysia, India, Egypt, and finally, to its heartbreaking climax in Morocco. In The Heart of the Dragon, two lives hang in the balance and Gabe and Nasih cannot afford to make any mistakes. A body is discovered in an Athens hotel room. There is no obvious cause of death, and robbery appears not to be the motive; the victim still wears a distinctive gold ring. Its surface is a flat, oval plane, with seven bezel-set diamonds. 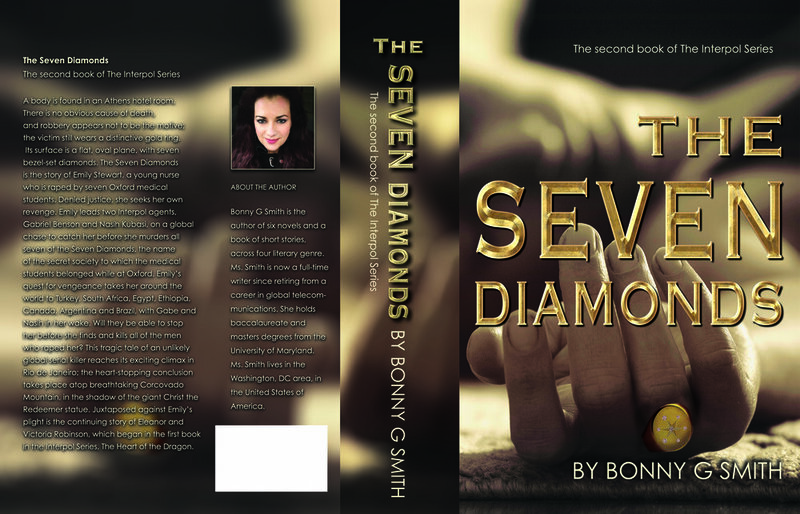 The Seven Diamonds is the story of Emily Stewart, a young nurse who is raped by seven Oxford medical students. Denied justice, she seeks her own revenge. Emily leads two Interpol agents, Gabriel Benson and Nasih Kubasi, on a global chase to catch her before she murders all seven of the Seven Diamonds, the name of the secret society to which the medical students belonged while at Oxford. Emily’s quest for vengeance takes her around the world to Turkey, South Africa, Egypt, Ethiopia, Canada, Argentina and Brazil, with Gabe and Nasih in her wake. Will they be able to stop her before she finds and kills all of the men who raped her? This tragic tale of an unlikely global serial killer reaches its exciting climax in Rio de Janeiro; the heart-stopping conclusion takes place atop breathtaking Corcovado Mountain, in the shadow of the giant Christ the Redeemer statue. Juxtaposed against Emily’s plight is the continuing story of Eleanor and Victoria Robinson, which began in the first book in the Interpol Series, The Heart of the Dragon.